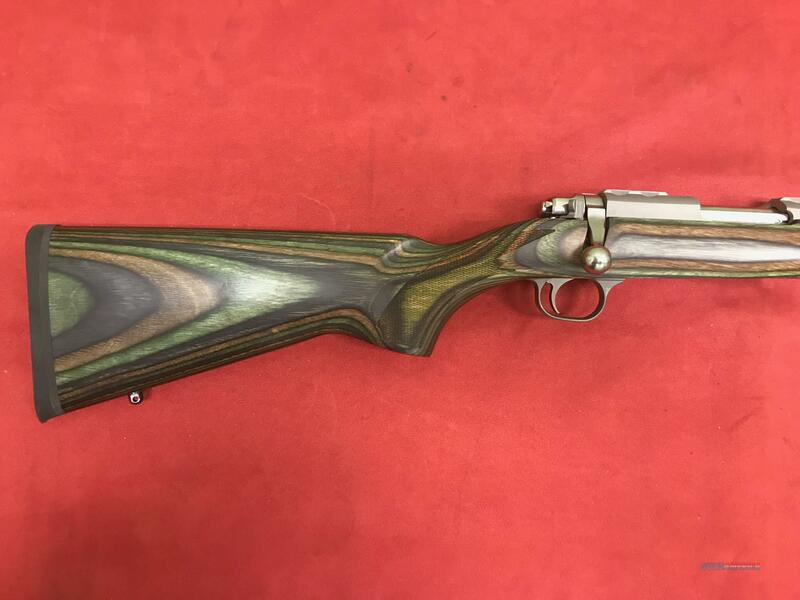 Description: Ruger model 77/17 Varmint Stainless, 17 WSM, NIB Stock Camo Laminate SightsNone Barrel Length24" MaterialStainless Steel Twist1:9" RH Capacity6 FinishMatte Stainless Weight7.5 lb. Overall Length43.25" Length of Pull13.50" Grooves6 Integral scope mounts, machined directly on the solid-steel receiver, provide a stable mounting surface for scope rings, eliminating a potential source of looseness and inaccuracy in the field (scope rings included). Three-position safety is easily accessible and allows the shooter to lock the bolt to load and unload the rifle with the safety engaged. Solid, heat-treated alloy and stainless steel actions feature a rugged, stainless steel bolt with 90° bolt lift and ultra-fast lock time for added accuracy. Detachable rotary magazine features a unique rotor to separate cartridges and provide reliable feeding. Mounts flush with the stock to eliminate protrusions at the rifle's balance point. Cold hammer-forged barrel results in ultra-precise rifling that provides exceptional accuracy, longevity and easy cleaning. Also includes: sling swivel studs.